During an address to a largely black audience at the National Baptist Convention conference in Kansas City, Missouri, on Thursday, Hillary Clinton stressed her long history with African American voters. But the relationship between the Democratic nominee and this community has at times been contentious. Her defense of the 1994 crime bill -- which her husband’s administration passed and she initially supported before more renouncing – was used against her in the presidential primaries. In 1996, Clinton used the controversial term “super predators” to talk about the nation's rising crime rate. “They are not just gangs of kids anymore. They are often the kinds of kids that are called ‘super predators.’ No conscience, no empathy. We can talk about why they ended up that way, but first we have to bring them to heel,” she said at the time. That remark came up during Clinton’s current presidential bid, when a protester wielding a banner with a portion of her 1996 quote interrupted a Clinton fundraiser in South Carolina in February. Prior to that meeting, she received criticism for saying “All Lives Matter” during a campaign stop near Ferguson, Missouri. After coming under fire for the remark, she has repeatedly said “Black Lives Matter” at various campaign events. 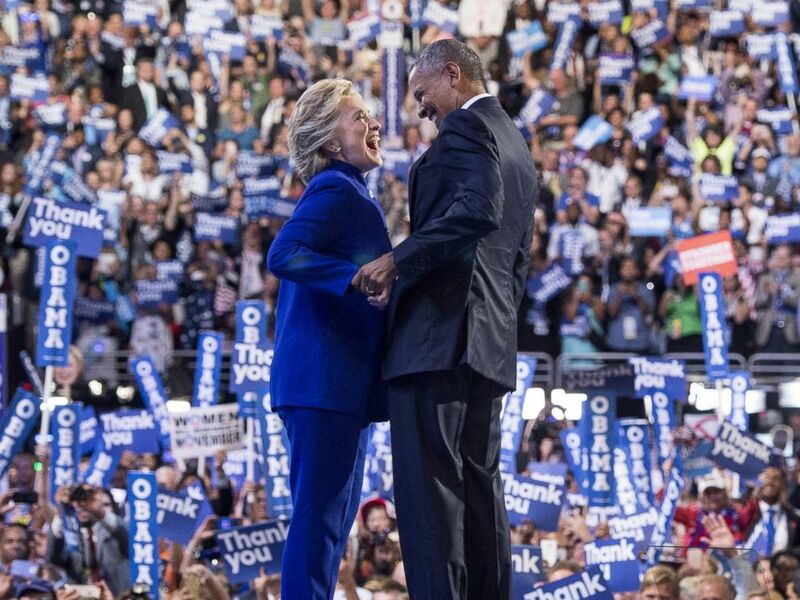 President Barack Obama is joined by US Democratic presidential candidate Hillary Clinton after his address to the Democratic National Convention at the Wells Fargo Center in Philadelphia, July 27, 2016. Clinton, unlike her White House rival Donald Trump, has made an effort to attend events supporting black voters, including ones held by the NAACP and the National Association of Black Journalists and National Association of Hispanic Journalists. At one event, Clinton named her black friends and colleagues after being asked what the most meaningful conversation she’s had with an African American friend. “I am blessed to have a crew of great friends, and I've had two chiefs-of-staff who were my African American women friends, Maggie Williams and Cheryl Mills,” Clinton said. She continued: “I really have had a lifetime of friendship going back to my college years when one of my best friends was an African American student, so I can’t compress into one conversation — they’ve supported me, they’ve chastised me, they’ve raised issues with me, they’ve tried to expand my musical tastes." Clinton has regularly held campaign events at black churches. "I am sure some of you are sick and tired of politicians who just show up at election time...you and your congregations deserve more," Clinton said Thursday. During her speech in Kansas, Clinton name-checked four black churches that she has visited during the campaign and offered several examples of how they're improving local communities. By comparison, Trump made his first trip to a black church on the campaign trail this past weekend in Detroit. 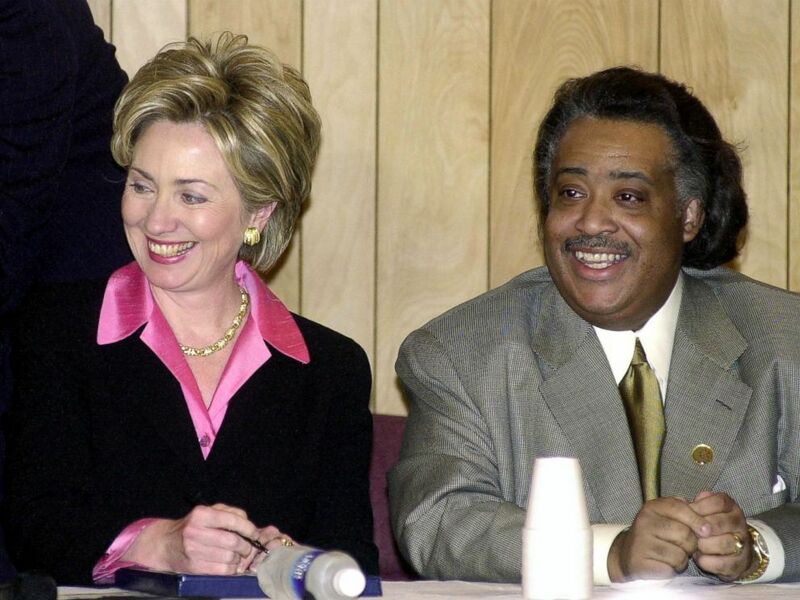 First Lady Hillary Rodham Clinton and the Reverend Al Sharpton attend the annual Martin Luther King Jr. Public Policy Forum in New York City, Jan. 17, 2000. Rev. Al Sharpton said that he expects Clinton to win the support of many black voters during the presidential election and described her relationship with the community as largely positive. "I think that she’s been someone that we know and may have disagreed with on some points in the nineties but generally has had a civil relationship” with the black community, Sharpton said. Sharpton, who has not yet formally endorsed Clinton but is expected to soon, told ABC News that the former secretary of state believes in issues that are central to black voters. "She has unabashedly identified with a lot of the issues and concerns that our community has raised and worked with President Obama on them,” he said, specifically citing her work with the “Mothers of the Movement” who were featured at the Democratic National Convention and have spoken on behalf of Clinton on the trail in the past. He added, “It is also no small thing that President Obama has fully embraced [her]." He said Trump’s “vitriolic kind of campaign" will ultimately draw more black voters to Clinton. Clinton is leading in the polls with two months to go before the November election. According to an Aug. 7 ABC News/Washington Post poll, Clinton received support from 89 percent of registered black voters while Trump got only 4 percent. After the conventions, that gap widened, with Clinton receiving 92 percent of black support and Trump receiving just 2 percent. The CNN/ORC poll that was conducted between Sept. 1 and Sept. 4 did not break the results down by race, but did show that Clinton leads among non-white voters, 71 percent to Trump's 18 percent.